The International Society for First World War Studies’ ninth conference, ‘War Time’, drew together emerging and leading scholars to discuss, reflect upon, and consider the ways that time has been conceptualised both during the war itself and in subsequent scholarship. 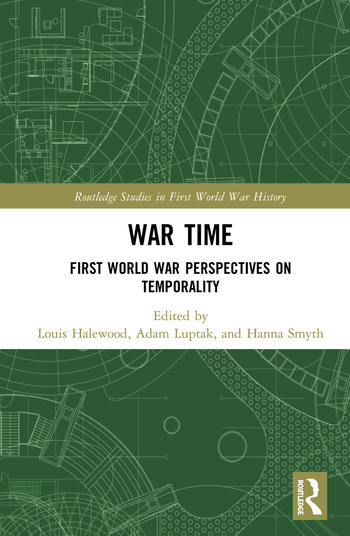 War Time: First World War Perspectives on Temporality, stemming from this 2016 conference, offers its readers a collection of the conference’s most inspiring and thought-provoking papers from the next generation of First World War scholars. In its varied yet thematically-related chapters, the book aims to examine new chronologies of the Great War and bring together its military and social history. Its cohesive theme creates opportunities to find common ground and connections between these sub-disciplines of history, and prompts students and academics alike to seriously consider time as alternately a unifying, divisive, and ultimately shaping force in the conflict and its historiography. With content spanning land and air, the home and fighting fronts, multiple nations, and stretching to both pre-1914 and post-1918, these ten chapters by emerging researchers (plus an introductory chapter by the conference organisers, and a foreword by John Horne) offer an irreplaceable and invaluable snapshot of how the next generation of First World War scholars from eight countries were innovatively conceptualising the conflict and its legacy at the midpoint of its centenary. No Time To Waste: How German military authorities attempted to speed up the recovery of soldiers in home front hospitals, 1914-1918. Fast Therapy and Fast Recovery: The Role of Time for the Italian Neuropsychiatric Service in the War Zones. A Stitch in Time: Inefficiency and the Appeal of Patriotic Work in Australia and Canada. Slow Going: Wartime Affect and Small Press Modernism. "It is at night-time that we notice most of the changes in our life caused by the war": War-time, Zeppelins and Children’s Experience of the Great War in London. Time, Space, and Death: Germany’s Living and Lost Aviators of the First World War. The Photo Albums of the First World War: Composing and Practicing the Images of the Time of Destruction. Brothers – and Sons – in Arms: First World War Memory, the Life Cycle, and Generational Shifts during the Second World War. Between Passatism and Futurism: The Rites of Consecration to the Sacred Heart of Jesus in a Transnational Perspective (1914-1919). Hoping for Victorious Peace: Morale and the Future on the Western Front, 1914-1918. Louis Halewood is a DPhil student in History at Merton College, University of Oxford. His research analyses visions of a new world order, and the role of maritime power in its creation and underpinning, in Britain, France, and the United States between 1890 and 1922. Adam Luptak is a DPhil student in History at Oriel College, University of Oxford. His research explores the topic of disabled veterans of the Great War in interbellum Czechoslovakia. Hanna Smyth is a DPhil student in Global and Imperial History at Exeter College, University of Oxford. Her research is transnational comparison of Imperial War Graves Commission sites on the Western Front, examining how they represented different aspects of South African, Indian, Canadian, and Australian identities in the 1920s-1930s.